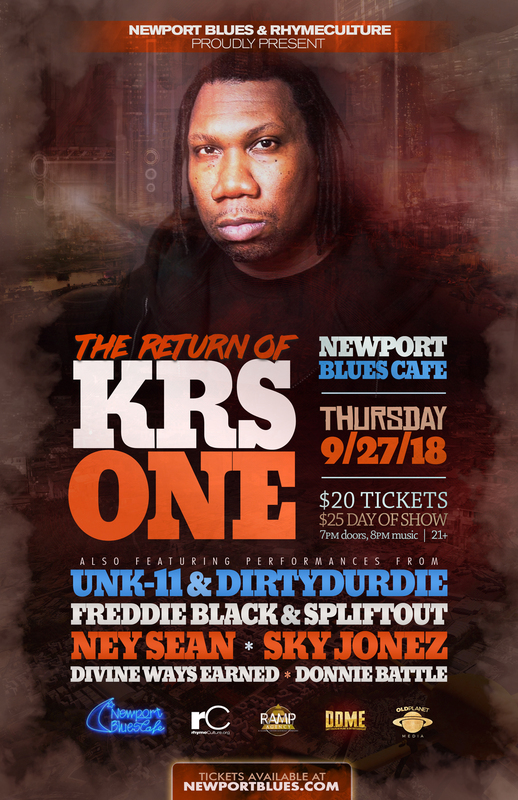 The Return of KRS-One | 9/27/18 @ Newport Blues Cafe | rhymeCulture.org | culture. music. news. KRS-One returns to Newport, RI on Thursday 9/27/18! The legendary Hip Hop icon performed here last year and sold out the Newport Blues Cafe so be sure to get your ticket early. He’ll be supported locally by Unk-11 & DirtyDurdie, Freddie Black & Spliftout, Ney Sean, Sky Jonez, Divine Ways Earned and DJ Donnie Battle – don’t miss this epic event! $20 tickets. $25 day of show.